The shocking truth about Sainsbury’s packaging? One of our zero waste readers sent me this story today about Sainsburys who are facing the first legal case over excessive packaging of a product. The company (Sainsbury’s) is being prosecuted over a “Taste The Difference” beef joint said to be extravagantly wrapped and harmful to the environment. ‘Excessive packaging on goods can cause unnecessary damage to the environment and increases costs associated with recycling and landfill,’ said Lincolnshire county council’s trading standards director Peter Heafield who started legal action following a call from a concerned shopper. The complaint centres on the store’s slow matured ultimate beef roasting joint, selling at £11.99 per kg. The cut was vacuum-packed and stored inside a plastic tray measuring 20cm (8in) by 15cm (6in), covered with a plastic lid and a printed cardboard sleeve. Sainsbury’s said it was ‘surprised’ by the council’s move and insisted the joint’s packaging has already been reduced by 53 per cent since the February complaint. A spokeswoman said they had also set an ‘industry-leading target’ to cut packaging by a third by 2015, with measures such as storing cereal in bags rather than boxes. The supermarket has held talks with the council but the prosecution is still going ahead on October 13. The 2003 Packing (Essential Requirements) Regulations Act gives no precise figures for what would be too much packaging. But it does say packaging should ‘minimise its impact on the environment’. If found guilty Sainsbury’s could be fined a maximum of £5,000 by magistrates or an unlimited sum if the case is sent to a higher court. Original story at the Metro and another version at Finance News. What do you think? Is this produce packaged so excessively it warrants a court case or have you seen worse? M&S reduce packaging? M&S switch from glass to plastic for wine bottle - what do you think? About time. I get really frustrated with Tesco and their plastic trays that contain meat. Most have “SP”, “Patent pending” and a recycle symbol but no recycling number!! ARGH! Anyone know what number meat plastic trays are? It does look over packaged. Why not just wrap it in shrink wrap plastic and put a label on that, avoiding the plastic case and card? I guess because it wouldn’t look as expensive. Luxury brand items tend to be the worst. Chocolates for example. I think there’s still a strong association between fancy packaging and quality in most people’s minds. 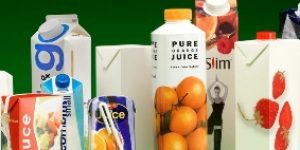 Packaging obviously isn’t just about protecting and transporting, it’s a lot about display and sales. In the business angle, you can justifiably make the point that where a bit of low cost plastic makes the item look more attractive and sell much better, then it is in fact an essential bit of packaging. I’d rather the retailers were up front about this and made this point, it would challenge us about our views on packaging and the type of products inside it. I am surprised at that! I thought Sainsbury’s were a little more eco aware then most of the others! I notice the store is in Lincolnshire, so it must be either at Lincoln or Spalding. I am surprised as I say, for Sainsbury’s now provide a recycling bin for people to put their packaging in before leaving the store. Brilliant re news about Sainsbury’s being done re their ‘over’ packaging. I shop there every week and am happy with their store, but on buying joints of meat I find they are always in horrendous large packages which I remove and wrap in my own freezer bags. Absolutely no need for this packaging. You then have to dispose of their packaging causing more waste. No wonder our country is in a state re refuse! I’m surprised by this because I generally find that Sainsbury’s packaging is better than the other supermarkets, and I have noticed that they have reduced packaging on lots of items in the last 6 months or so. Also all their organic fruit and veg come in compostable packaging, which is better than plastic bags (although obviously not as good as no packaging). Having said that, I think all supermarkets could reduce their packaging on meat. The plastic trays can’t be recycled where I live and the paper ‘nappies’ under the meat – all totally unnecessary. If a pack of sausages can be shrink-wrapped, why can’t all kinds of meat? I worked in a butchery department years ago and we sold similar shrink wrapped joints with just a sticky label on them! Absolutely no need for the tray and cardboard. I’m shocked at the amount of ignorant comments I’ve been reading about this story! Why on earth do people think this amount of packaging is good? We buy what little meat we eat from a local butcher, and we always take a container with us, so he doesn’t have to wrap it in anything. Saves on waste, and saves the meat being contaminated by the toxins in the plastic wrap too. Tesco are the worst for unmarked plastic IMO. ‘Not recycled’ OR ‘unrecyclable’ meat packaging? Convince me it is not because it might be unwashed and yucky! Convince me ‘recyclable’ is not being used for ‘incinerable’! How much plastic that can be recycled isn’t because of the labelling or lack of it? Question your Council on what exactly their contract is for. Packaging of meat is definitely an area which needs more attention. Agree taking your own container is best. I bet they’re taking Sainsburys because Sainsburys are the best supermarket at packaging anyway, making them most likely to respond, rather than, as with Tesco tree-cutting, most likely to flout the law and pay the fine rather than change their behaviour. In general, I’ve found Sainsburys pretty good for packaging; their cereal, for example, is in smaller boxes per gram and the internal bag can be recycled along with plastic carrier bags at any Sainsburys with a bag bin. The outer is cardboard, of course. A lot of Sainsburys Basics range is packaged in very easy to recycle containers and they provide instructions for how to recycle the stuff we can’t get collected at the kerb. It’s not the first legal action but it may be the first against Sainsbury’s. Our laws have had too many loopholes. I remember a chocolate fingers company and an office supplies company being successfully prosecuted. Anybody can complain to Trading Standards. Which magazine has been asking the public for examples of overpackaging. I would like to see the reductions introduced across the board and not just in particular areas of a company ie whereas single use carriers have to be requested in the large stores, in the locals you have to fight to avoid them. We know you’re there – you’ve got a big sign outside! @Ben: I tend to agree; the more ‘luxury’ the item the more packaging it comes wrapped in. @John Ashwell: I tend to find Sainsburys pretty good as well John; I see that WRAP spoke up in their support too. Thanks for the Guardian article and you’re the same for us in using your local butcher with your own containers – it’s a great way to support the local economy and save waste. @Zoe Williams: I think all supermarkets are pretty much the same on meat packaging too; I guess it’s a case of we have to start somewhere and unfortunately for JS, they are the one we are pointing the finger at. @Jane: Highlighting the meat packaging issues is important and hopefully this story does exactly that; not sure what the outcome will be, but it will be interesting for the future. Thanks for the heads up on Which magazine; we should start a group campaign! @Ailbhe: Good point about JS most likely to respond. Their CSR seems to be very important to them, so it will be interesting to see how they handle this. I’ve seen worse, but I’m glad to see a precedent being set. Maybe other companies will smarten up. Or in Grantham! Trust Grantham, although I didn’t realise we were that green! There was a photo somewhere on the web showing a complete bag of groceries removed from their packaging to demonstrate how much packaging there is. This was about Sainsbury’s packaging.. I cannot find it now! Any help is appreciated.